Guys, Leave These Ladies ALONE! Previews made us aware of a new comic series from Image called Maneaters, written by Chelsea Cain. 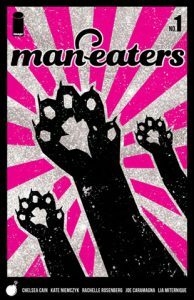 In an interview, here’s how she describes it: “Maneaters is a monster story about women who turn into ferocious killer wildcats when they get their periods. They are very scary and dangerous and extremely grumpy. Naturally their unprovoked attacks cause a great deal of societal consternation, and measures are taken to help the women control themselves.” Got that? With art by Kate Niemczyk and Rachelle Rosenberg, the first issue pounces on the shelves in September.